The Flower Pot is dedicated to improving its online presence and uses many of the free tools available online for that purpose. Google offers a free Small Business Online Marketing Guide that mentions a list of ten ways to use the internet to make your business grow. Number four is Geotargeting. According to Wikipedia, geotargeting is the act of establishing where your potential customer is located, and providing location-specific content. Now, knowing where people are located is not that difficult with social media tools like Facebook, Twitter, Instagram, Foursquare, and more using the check in feature. Remember Google Map's Street view option? Now you can get a tour of the inside of your store which will be accessible through Street view when you click on the double arrow. When you add this option to your marketing strategy, you're offering a far more interactive, rich, and content-filled experience to the customer. This tour is connected to the business's Google places page where people will be able to see customer reviews, images and any other information you choose to upload. 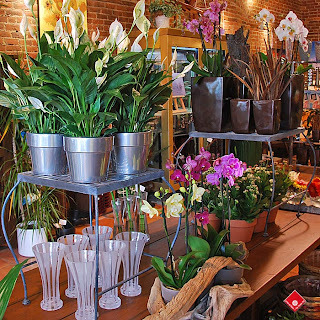 The Flower Pot's Google store tour has been available online for several weeks now. Something nice might catch your eye while you're in our virtual store, and if you're interested in getting a tour or social media recommendations for your own business, don't hesitate to contact us, 514-938-1234. We'll tell you how you can get in on the action.